If a pipe lacks either, then it is quite simply not a System pipe, whether considered from the perspective of history, engineering, marketing, or the smoking experience itself. To the two patents mentioned above, Peterson has traditionally (but not always, as we discuss in the book) added a third, strengthening element, although it’s not in the patent: either a domed army-mount on the Standard and Premier Systems, or a ferrule with Space-Fitting Stem on the De Luxe. 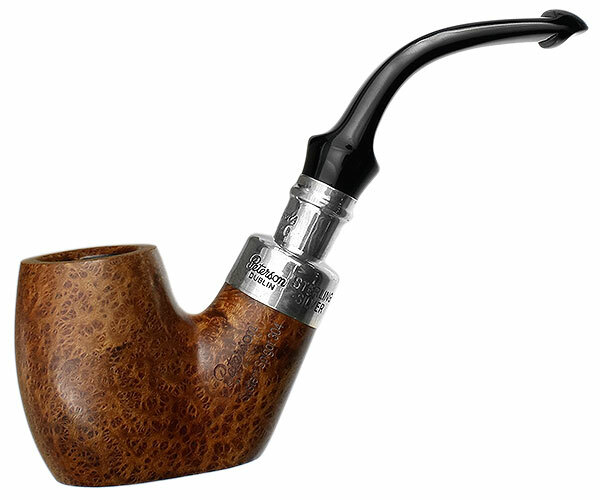 As lovers of estate Petes have noticed time and again, the nickel or sterling mount makes the System (like its cousin the Peterson Army) the toughest pipe on the market, impervious to shank cracks, weather, and too loose or tight tenons. About the only thing that could make it tougher would be a spigot mount. Never in Peterson’s history, until recently, has there been a genuine spigot System. 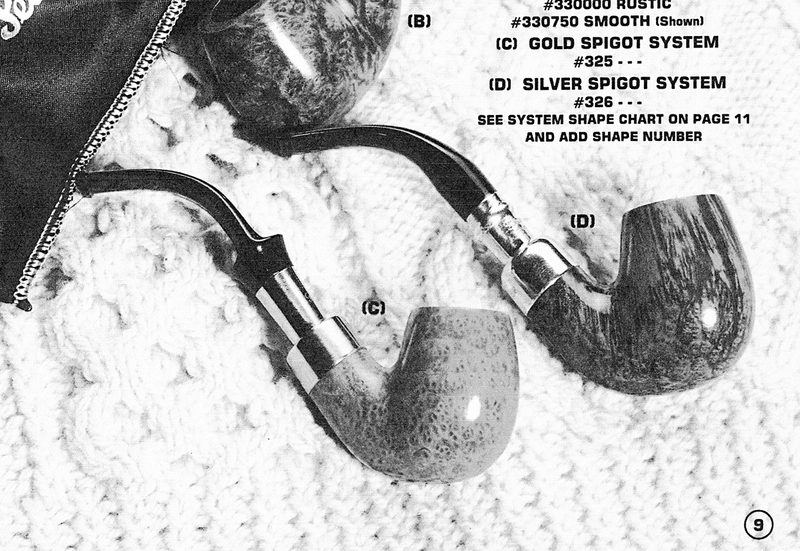 One was advertised in a Hollco-Rohr distributor catalog c. 1987, but as you can see from the photograph below (which I’ve digitally enhanced to show the mouthpieces more clearly), it actually featured a traditional fishtail spigot mouthpiece and thus violated Charles Peterson’s second design principle. 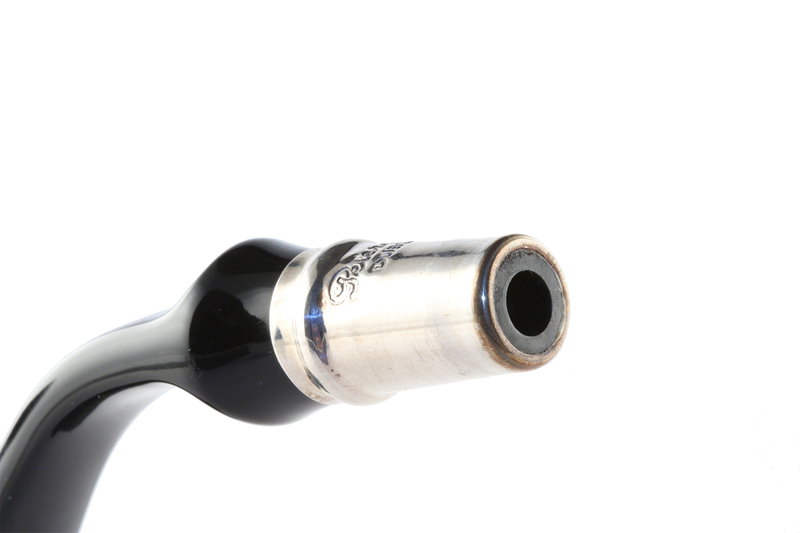 And a fishtail mouthpiece with a reservoir will not smoke like a System pipe. Trust me, I’ve tried it. You get a lot of hot, wet smoke. There’s a reason it’s called a “System”—it needs both parts to function correctly. The c. 1987 “Spigot” System had a fishtail! In 2016, for the IPCPR show, Peterson produced a handful of Premier Spigots. 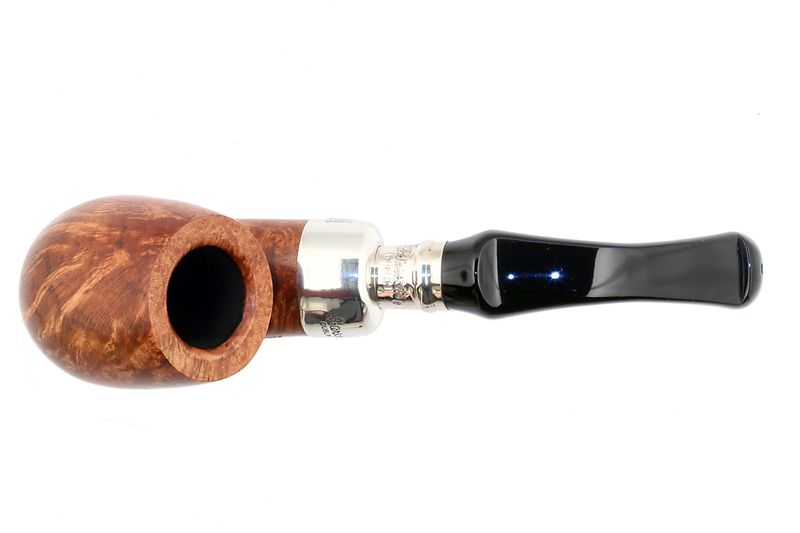 “We used Premier-grade bowls and stuck a spigot mouthpiece on them,” Conor Palmer at Peterson recently told me. “We only produced them as a one-off,” he said, “part of some IPCPR picking stock that we created for last year’s show.” As you can see, they all feature the new Hinch flat-nose mount. When Laudisi (aka Smokingpipes.com) visited the factory in March, they acquired the remaining pieces and quietly put them up on their Smokingpipes.com site. I have no idea how many, nor what shapes were made, but I did pick up a few photographs and had Laudisi send me a 312 to give it a go. Because of a quirk in the factory computer program, the boxes were incorrectly labeled “Standard System Premium Spigot,” but the bowls, as Pete freeks quickly noticed and Conor Palmer confirmed, are indeed Premier grade. The other piece in the next-gen System is a new acrylic P-Lip. 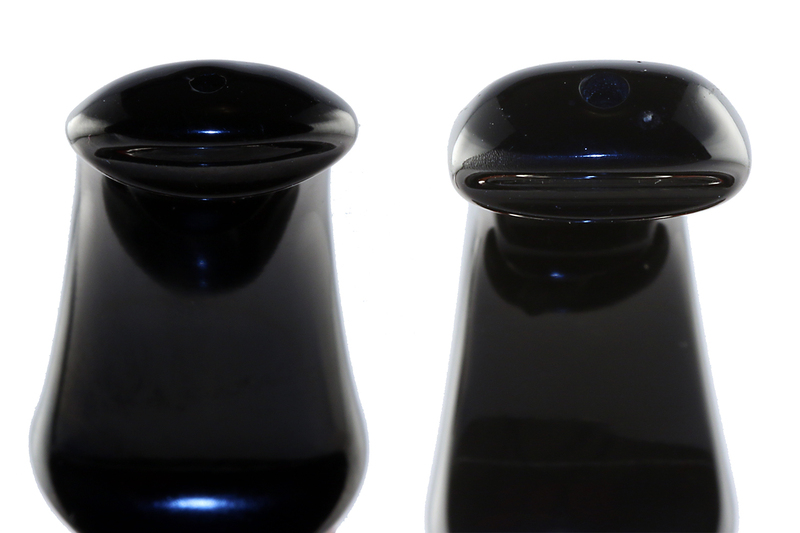 As you can see from the comparison photographs, the button has a slightly different shape, but like the best of the vulcanite P-Lips, it has a well-developed upper and lower wall with a wide, flat shelf, elements crucial for comfort and clenching. Long-time readers of the blog will know I’m something of a Luddite, and an acrylic stem is something I have learned to tolerate rather than admire, although that may be changing. My chompers are as far away from movie-star glam as can be, with pointy dog teeth that always leave a mark. Acrylic is more slippery than vulcanite, but I found after the first smoke that my clenching style adjusted without any problems. gorgeous articulation of the walls and clenching shelves! 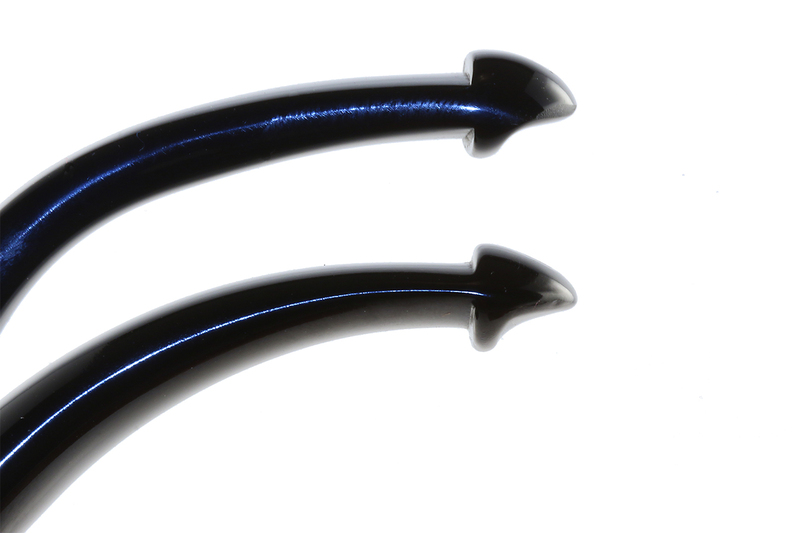 The acrylic P-Lip not only follows Charles Peterson’s design principles, but even improves on it. The air hole is graduated, as per patent specs, from 1.5mm at the button to 5mm at the base. The first improvement, seen in the photo above, is in the better articulation of the button walls and clenching shelves. This has been a problem with the Standard and Premier mouthpieces of the past several years and comes as a great return to form. A second improvement is in the air hole at the button. It is upturned, as per patent specs, but unlike its vulcanite predecessors it is chamfered, as you may just be able to see from the detail photographs. This means a better airflow as well as a little greater ease when inserting a pipe cleaner. There is no screw-in tenon extension, normally part of the Premier and De Luxe treatment, for two reasons: first, because Peterson hasn’t found a partner who can chase the threads into the acrylic; and second, the company is in the process of finding a new manufacturer for the extensions. An acrylic mount will, of course, be another feather in the System’s cap: stronger and so much easier to maintain than vulcanite. Whatever will the old-time System-user do with all that time freed-up from cleaning and buffing oxidized stems? So how does the System Spigot smoke? Or to use “precision of language,” as Jonas from The Giver might ask, “does it smoke like well-functioning System?” The answer (drum roll, please) is . . . an unequivocal full-on Yes. The 312 I’m smoking is as cool and dry as the finest Systems in my rotation—at least, after a dozen or so smokes. For me, that’s saying a lot, as I don’t believe there is a pipe that smokers better, all things considered, than a well-made System. I have several fishtail Petes that are absolutely first-rate smokers, but the fact remains that nothing (to my taste) smokes as comfortably between the teeth, as cool and dry, or as flavorful as a graduated P-Lip mouthpiece in conjunction with a System reservoir. There is one final peculiarity to ponder with the System Spigot. I have other 312 Systems in my rotation, but unlike them, the Spigot System smokes my Virginia flakes to absolute ash. It also requires fewer relights. I can only hypothesize that this has to do with the Spigot mount. 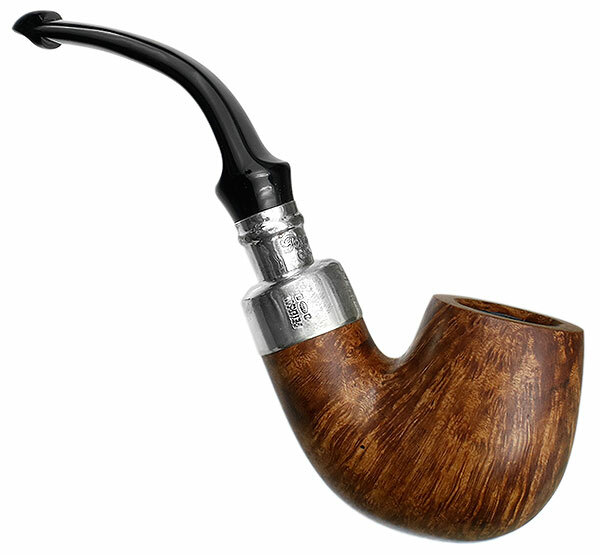 The metal-on-metal of the tenon-shank connection transfers heat more uniformly than vulcanite-on-briar or acrylic-on-briar, creating a tighter seal when smoking. The tighter seal results in a better airflow. Tom Palmer said he doesn’t know when the company will go ahead with the next-gen System, but here’s hoping it’s soon. Can you imagine some of the multi-color acrylic rod used on new product lines applied to the System? Tom also said that if the right grade of bowl materializes, there are several shapes that could be used. These include not only traditional System shapes (including the B42 / Darwin), but shapes like the B10 and B11. Even more intriguing was his inclusion of several straight shapes – the 107, X105, and 150 among them. Straight Systems smoke like the Sahara – almost too dry for me. But that’s another story. In the meantime, it looks like the toughest pipe on the planet may just get tougher. I’ll post this on Smokers Forums for Peterson Devotees. I acquired, from Smokingpipes.com – what I had noticed as a “better-feeling” XL02 approximately a year or so ago – acrylic stem – and yes! 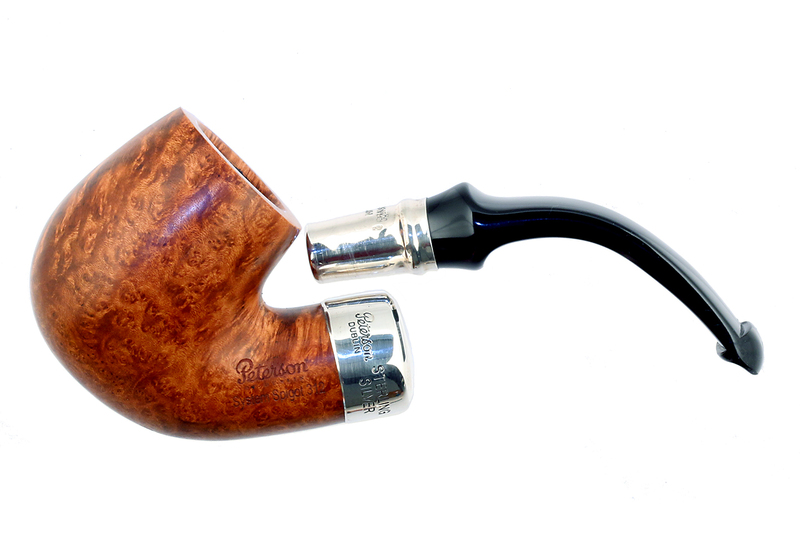 it works wonderfully – quite enhances the enjoyment of smoking that pipe! .As usual, will forward to CORPS mbr.’s for our smoky education. I enthusiastically await these new system spigots, I think it’s the logical progression for the line. 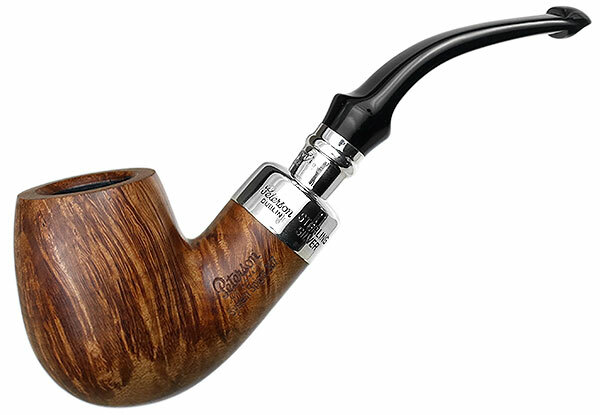 For me the achilles heel of the Peterson System pipe has always been the vulcanite mouthpiece. Not the design but the material itself. You can fuss and polish and wax those stems in endless subjugation but they will, in time, end up smelling and tasting of old tired rubber. Acrylic is the answer. I acquired three deluxe system pipes recently from an Italian dealer who listed the P lipped pipes as having acrylic mouthpieces, and the also have the metal tenon/condensor extension. They do seem to be acrylic, at least as far as my teeth can tell, and they work wonderfully. Although I do smoke the pipes with the condensor in place I have smoked them without it and it seems to make little difference. Perhaps a bit drier eith the condensor in place, actually, as the condensor seems to keep the condensation away from the inlet, thus keeping it from migrating up the stem into the mouth. 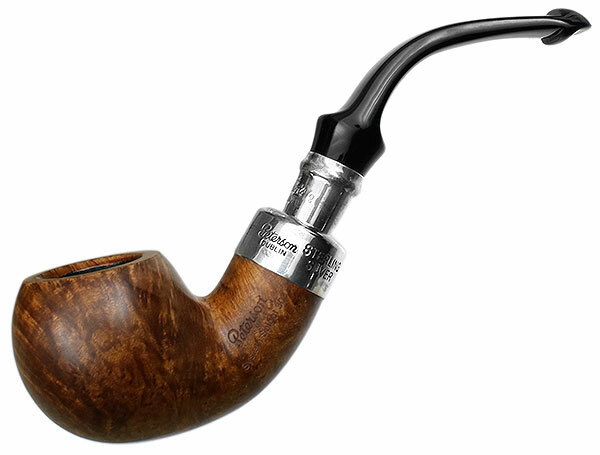 Still, a silver spigot system acrylic stem even without the condensor would be a wonderful thing and I’d hope to see it applied to pipes like the XL24, House pipes, and definitely the Darwin. These could prove to be among the very finest Petersons ever made! Well, these condensers just do not work. They are nothing more than a gimmick really. I have seen them in a couple of my pipes, french ones (Courrieu) and some Petes. Quite useless I’m afraid. Hi Phil! I want to very respectfully disagree with your assessment of the Pete tenon extensions. They’re not condensers, but were designed by Charles Peterson (in bone originally, but aluminum since 1963 or so) to extend the space-fitting tenon down further into the reservoir for a drier smoke on the Premier and DeLuxe System lines. In the bent Systems, I believe (just from my own experience, of course) they do indeed function as prescribed. The Arans have been available in both mounted and unmounted versions for quite awhile, and are produced both ways in current production. Mario Lubinski was the one who added the nickel band to the latest version of the Aran line, and it proved so successful that Peterson doesn’t produce many the other way. Well, let’s hope Peterson is listening to your comments! Previous Post01. “Ceci n’est pas une K&P”: Goodbye Shape 309! 01. “Ceci n’est pas une K&P”: Goodbye Shape 309!